The garden’s ceremonial entrance, just east of the hospital’s main building greets visitors with three beautiful bronze statues sculpted by local artist Kathy Spalding. Spalding, who has designed many sculptures throughout Naples, is well known for the 22,000 pound, 40 foot flying-fish fountain located at the Atlantis Resort in Nassau, Bahamas. The designs she created for the Garden of Hope and Courage took almost three years to finalize and now grace the garden’s entrance. Two feather like sculptures each weighing about 1,500 pounds frame a 500 pound sculpture of a woman holding a hibiscus stamen. This statue has become the garden’s icon known as “Bloom”. Around “Bloom’s” base one can find dedications made by visitors for loved ones. wn as the formal garden filled with blooming annual flowers such as begonias and impatiens. The view from this garden overlooks the lake under a curving trellis with growing bougainvillea. This area is home to benches and trees named in recognition of loved ones. As you follow the 8 ft. concrete path around the garden you will see plants such as pickerel weed, canna lilies, duck potato and blue-flag iris lining the lake. Other species of plants you will see include bamboo, a teddy bear palm that trunk is as furry as a real teddy bear, red buttons, bat plants, Christmas palms, Hurricane palms, magnolia trees, bulnesia trees, viburnum, oak trees and more. 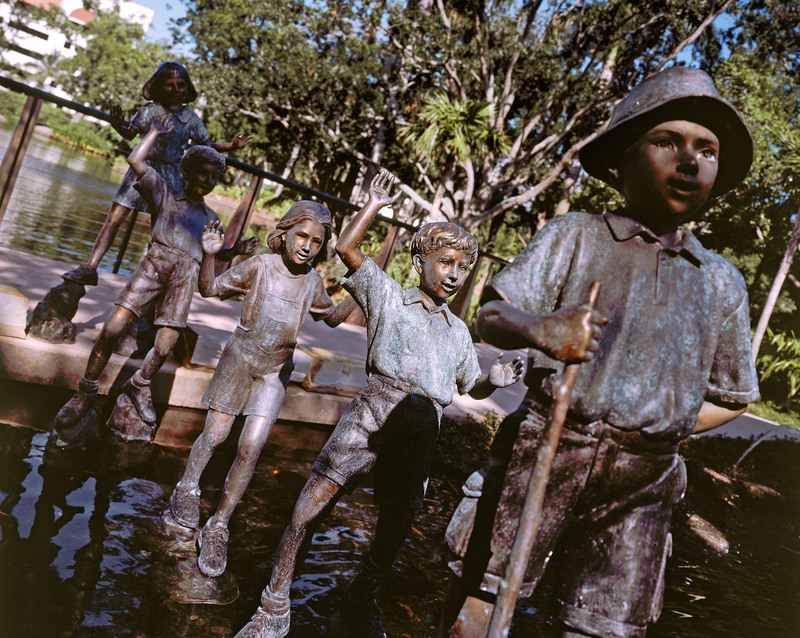 The Dalton Family Children’s garden includes sculptures of children skipping over a pond, a bronze sea turtle that children can play on, a sandbox, a wishing well and large chimes that children can play by hand. Right next to the children’s garden stands the Tommy Bahama Pavilion. 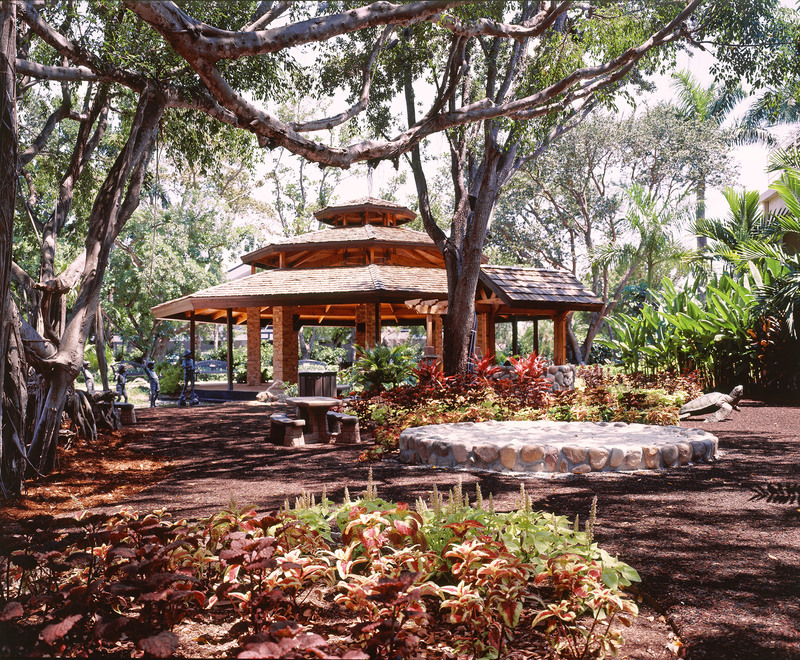 This pavilion is an open-air octagonal building that can be used for a variety of functions – including activities for hospital patients and employees. This garden is a tribute to Jan. “I think she would be really proud,” said Bob Emfield. By blending water, plants, sculpture and the natural topography of the earth into a therapeutic retreat, the garden will offer patients a chance to reduce their negative emotions and stress. Its purpose is to inspire hope and courage; two necessary ingredients in the fight against cancer and all illness.